What: This workshop will cover what every hemp grower should be aware of before getting started, effective practices from irrigation to understanding the basics of the plants, understanding CBD is an expanding market, a Who's who of Addison County hemp growers and processor and more. Please email Annie@acornvt.org if you’d like to be placed on a waiting list or are interested in a future hemp workshop. *This was the previously scheduled Feb. 13 workshop which has been rescheduled due to weather. Who: Facilitated by Seth Walker of Healthy Living Market and Dan Reilly of Equinox Food Brokers, a Vermont company that specializes in helping growing businesses understand the processes & expectations of distribution. Seth will present information on selling direct to stores & share information on their new purchasing protocol. Between the two facilitators, this is an opportunity to help meet & expand into new markets successfully. Sponsored by Addison County Economic Development Corp and ACORN, this meet up with include plenty of time for businesses to engage with each other and share successes, challenges & failures. This is designed for small and emerging businesses. Space is limited to encourage chat time. Ideal for specialty food producers & farmers with value-added producers and a great follow-up from our November 7th Producer Buyer Forum. Lite fare provided. 8:30 registration & coffee talk. Prompt start time at 9:00. Non-refundable, all payments are a donation to ACORN. If canceled due to severe weather we will do our best to reschedule via email. What: This hemp round robin is a follow-up to previous hemp meetings and workshops hosted by ACORN. Established growers Rye Matthews and Pat Fifield will be there. This is super small, casual shop-talk hang out so sign up early! Dig deeper into soils, irrigation, equipment, CBD clones, cultivars, and MORE! Our partner, Tandem, opens their meeting space on Main Street for this meet-up. Registration fee covers the cost of one signature cocktail or two beers along with lite fare & beverages. Cash bar for more bevvies. At 7:00 head across the street to ACORN supporter Hatch 31 for super pub fare and crazy fun, local tunes with the Welterweights. Who: Facilitated by Bay Hammond of Doolittle Farm- farmer, grandmother, educator in sustainability & Taylor Hutchison, of Footprint Farm, young farmer extraordinaire, will share insights creating home, work and life balance. Bay and Taylor represent a continuum of experiences across decades of farming and lifestyle changes. This is going to be a fun group of people. Join the conversation and share your experiences. A lite lunch will be served allowing for casual chat time and general conviviality. Space is limited, click here to save your spot now! This event connects buyers, producers across all food categories, distributors and food system thinkers. 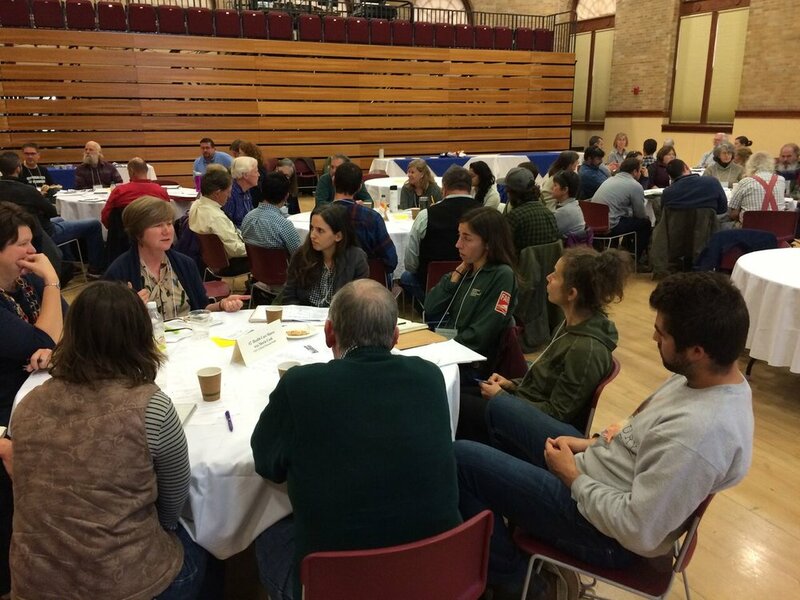 The 2018 Forum was held Wednesday, November 7 at Kirk Alumni Hall, Middlebury College. This event connected buyers, producers across all food categories, distributors and food system thinkers. There was a panel, a Keynote by April Moulaert of Vermont Tortilla Company and networking and strong alliance building to promote stronger business to business partnerships. All Addison County growers are invited to join us for our series of 2018 ACORN sponsored workshops and gatherings. Pre-registration is required, space is limited. Click on the highlighted title of the workshop you'd like to register for to pay via EventBrite. Light snacks will be provided. All payments are a donation to ACORN's mission and tickets are non-refundable. 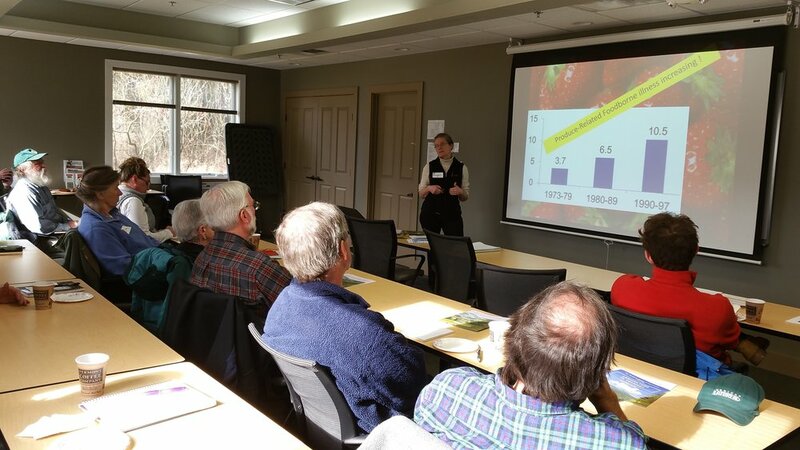 ACORN hosted a series of grower meetings around Addison County in early 2016. In these intimate meetings, we were able to glean information from growers across food categories and farm sizes. We learned what obstacles growers were facing, and as well as opportunities for growth and sustainability. How do farms get funding like the food shelf's funding? ACORN hosted the aforementioned series of grower meetings in early 2016 to assess the needs and desires for future workshops and gatherings. These meetings resulted in the first annual ACORN Producer and Buyer Forum at Middlebury College in March 2016. 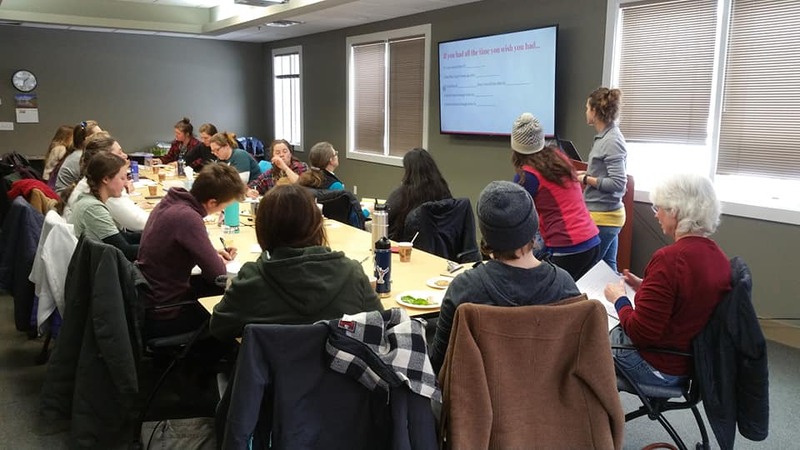 This successful event had over 80 attendees and connected regional and local buyers with farmers and food producers who were looking to scale up and expand sales. Two panels of buyers spoke from various perspectives: institutions, non-profits, food hubs and retail operations. There was also a "cocktail party" period of time for networking where buyers and farmers were able to connect on a personal level, resulting in new local and regional sourcing contracts! ACORN plans to organize more grower workshops and host the Forum event annually, with a dynamic theme based on growers' current needs and industry trends. If you'd like to request or host a workshop with ACORN, please contact us at info@acornvt.org.